These Tasty ice creams are the perfect treat for your next indulgent “cheat day”. I often opt for the healthier, better-for-you ice creams like Enlightened and Halo Top but sometimes you just have to give into to that sweet tooth and have a bit of sugar. No sweat… just get back on track with your diet and lifestyle the next day. YOLO (you only live once) so why not just give in to the temptation and enjoy that pint of ice cream?!?!?!!! Remember my blog tagline is “Eat Healthy So You Can Have Dessert” so just keep that in mind ok? What flavor of Tasty ice cream will you be giving a whirl first? Check out that White Chocolate Raspberry Lava Cake ice cream from Tasty… omg! This flavor here is for the rainbow candy sprinkles enthusiast (me!!). The Vanilla Galaxy Twist is going to blast you off into euphoria while chowing down on this pint. The ice cream flavor also has silky blue frosting swirls with a vanilla ice cream base. In this out-of-this-world delicious ice cream pint, you are also going to enjoy some caramel stars, chocolate chunks, and cosmic crunch. Tasty really went all out with this fun flavor! I don’t think ice cream gets any better than this folks! WOWZA! 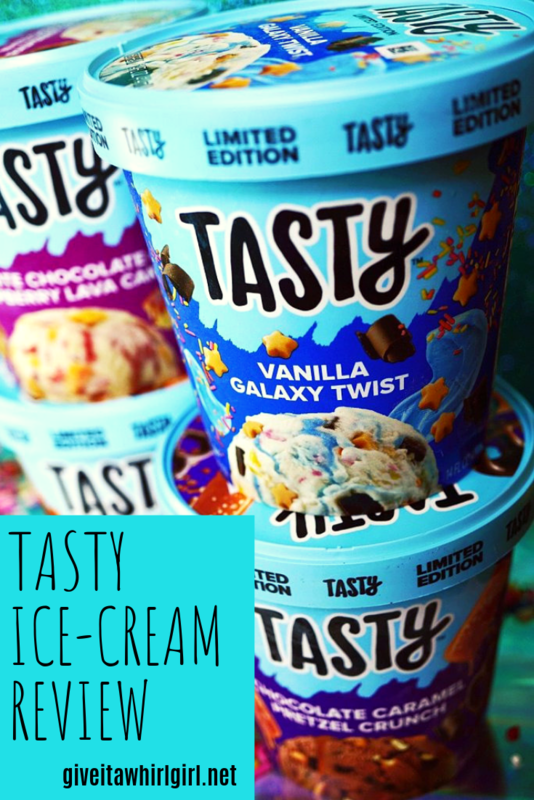 Vanilla Galaxy Twist is chock full of goodies! With the Peanut Butter S’mores Smash flavor of Tasty ice cream this is where two flavors collide and marry into one hell of an awesome flavor! The ice cream itself has a peanut butter flavor and inside you are going to experience some marshmallowy goodness and miniature peanut butter cups. And to take this flavor to a whole other level you will also enjoy a sprinkling of graham cracker crunchies and a fudge swirl mixed throughout. This flavor is for the chocolate lover and connoisseur! Inside this Tasty ice cream pint, you will find some smooth and creamy chocolate ice cream mixed with pretzel bites and a dreamy salted caramel swirl! Yes please and YUM! Here is the Chocolate Caramel Pretzel Crunch ice cream from Tasty! The White Chocolate Raspberry Lava Cake Tasty ice cream pint is like my dream flavor here! This unique flavor features a white chocolate ice cream combined with raspberry ribbons and swirls along with some get this… CHUNKS OF CAKE! Oh my goodness gracious! I kinda hate to say it but this ice cream pint is one that I would honestly hoard just for my own sweet self. I am head over heels in love with anything that is raspberry flavored and when you throw some cake into the mix? BLISS! Pure bliss! Dig into this White Chocolate Raspberry Lava Cake ice cream from Tasty brand! As you can see in the nutrition facts label below this is an indulgent treat. The nutrition facts vary by flavor. The one shown in the photo below is for the Chocolate Caramel Pretzel Crunch flavor. If you give in to your desires and lose control AND eat that whole pint you are going to set yourself back a whopping 710 calories. Might just have to run a marathon to burn that all off. Am I right? One serving contains 25mg of sugar. If you eat the whole pint you will be consuming a massive amount of sugar, a total of 65mg. As mentioned earlier in this post, these ice cream pints are reserved for a cheat day treat. It is ok to have a sugary treat every now and then. I believe in eating with balance. What I do is eat healthy and clean most of the time and then allow myself to indulge in a not-so-good-for-you treat. I don’t want to deprive myself of the fun things in life (like ice cream). Gotta say these four limited edition ice cream pints were thoroughly enjoyed by my little family of 3! I truly hope that my Tasty ice cream review inspires you to hunt these down and give them a whirl! I’m going to give some mad props to Tasty for offering up these creative ice cream flavors. I also really enjoyed the delicious creaminess and texture of the ice creams. I am looking forward to Tasty releasing some more ice cream pints. Pretty sure I will be a regular buyer of this brand. It is so hard to resist eating the entire pint all by your lone self because they are just that good! If you are a regular reader over here at Give It A Whirl Girl, you can probably tell by now that one of my major weaknesses is ice cream. I love to review it and I love to blog about it. And finally, I love to eat all of it! In the near future, I will be reviewing more ice creams since summer is fast approaching and I can’t think of a better sweet treat to eat than ice cream when it is warm out. What flavor of Tasty Ice Cream will you be indulging in on your next cheat day? Leave me a comment and let me know which Tasty Ice Cream pint you will reach for first! Ready to give Tasty ice cream a whirl? This entry was posted in Product Reviews, Tried It Out Tuesday and tagged cake, caramel, cheat day, chocolate, ice cream, peanut butter, pretzel, product review, raspberry, review, smores, Tasty, Tried It Out Tuesday. Bookmark the permalink. That white chocolate raspberry looks so good. I need to add it to my grocery list. Excellent choice! Love love love the raspberry! Oh man I want to try out all the different flavors. They sound really good. Something for everyone in the family to pick and choose from. It looks so good, but alas … I can’t have it because of the carbs…. Can I just say, your pictures are outstanding! And make me want to eat them right up! But I will be taking a trip to my grocery store tomorrow, because I have to try the Chocolate Raspberry Lava Cake!!!!! Thanks so much Kelly! I will be eating that flavor tonight. Last night me and my daughter had the galaxy one. So good! Tasty ice-cream has the perfect amount of creaminess! I haven’t seen these, I am going to be on the lookout, especially for the lava cake one. Yum! I feel like I’ve seen these at my grocery store. The chocolate caramel pretzel crunch sounds AMAZING! Vanilla gallery twist looks yummy! Thank you for a great review. My mouth is watering. I love a good ice cream and your bowls are adorable! I’ve bought Tasty brand utensils and pans before but didn’t know they were making ice cream now. Thanks for sharing! I just found out that they were making Tasty ice-cream! I had to scoop up all 4 pints at Kroger and I am so glad I did. Hope you enjoy it!